Cotswold Eastleach Lace Up Oxford Shoe Men's Shoes are made with a smooth leather upper and soft leather lining. Neat upper styled with smooth lines, perfect for formal occasions. Neat overlays design bordered with parallel dual stitching accents. Full lace up front with five perforated eyelets and matching laces. Padded collar for comfort. Durable PU sole gives good grip when needed. Cotswold Mickleton Lace Gibson Men's Shoes are both stylish and practical. Made with high quality smooth leather upper. Styled with a neat moc front. Light weight in design the PU sole is both light and durable. Perfect for both formal and casual use. 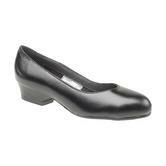 Cotswold Farmington Ladies Loafer Style Shoes are a ladies casual lightweight slip-on shoe. Smooth leather upper with overlays and stitching accents. Lined inner to deliver comfort during the day. Comfortable flat sole for excellent fit, this shoe offers superb quality. Perfect for light casual use. Orbit Polycotton trousers are made fron high quality materials. It includes 2 front slanted pockets, back button up pocket. Stylish and comfortable to wear, these poly cotton trousers are made from 65% Polyester 35% Cotton fabric with a dirt-repellent finish. They include zip fly with button & button hole top fastening, belt loops and come equipped with front and rear pockets for storage. These work trousers from orbit have a modern cut, which allows for a better range of movement and improved comfort. They include zip fly with button & button hole top fastening. Comes equipped with front and rear pockets for storage. Very good looking and durable trousers with Zip Fly closure and sewn in crease. As most of other work trousers it comes with rear pocket, belt loops, hook & bar fastening. Made from 245gsm 67 Polyester and 33 Cotton Fabric. Sewn in crease down the front of both legs. Two side pockets and One rear jetted pocket. Henbury H603 Single Pleat Trousers made using 100% polyester 175 gsm Fabric. Front side pockets, single back pocket with button and flap. The Henbury H603 Single Pleat Trouser is available in Black colour. Size - 42" Regular Leg only. Premier PR524 Black Poly\Wool Flat Front Trousers, Size - 38"
Fashionable flat front trousers are made using Easycare wash friendly fabric. Button and hook 'n' bar fastening with YKK zip. Two swing hip pockets one rear jetted pocket. 55% Polyester 45% Wool Plain Weave, Teflon fabric protector. Available in size 38" only. 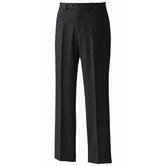 Portwest London Trousers are made from stylish polyester and viscose fabric. Comfortable and stylish, these trousershave two side pockets and a button fastened rear pocket. Excellent trousers that can be worn for office or casual wear, they give you comfort and style. Their poly-Viscose material ensures durability and functionality. 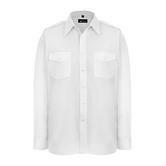 Classic Fashion shirts from Disley. Round cuffs with button on each placket. Semi-tailored fit for more comfort. Fabric Content: 65% polyester 35% cotton 115g easy care fabric. Traditional long sleeve shirts with fashion collar. Easy Care finish pilot shirts with Classic Collar. Two pointed breast pockets with button through flaps, Left pocket is a pen pocket. 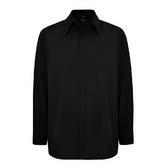 Williams P215/1 Long Sleeve Pilot Shirt fabric: 65% polyester, 35% cotton - 115 g/m². The Orbit Classic short sleeve shirt is a cool, stylish shirt that can be worn formally or casually. Lightweight, this shirt is ideal for wearing in warm weather and is very light to wear. Orbit CSSS Classic Blue Short Sleeve Shirt is made from 65% Polyester 35% Cotton. 7 button up front provides an excellent fit every time. A semi fitted blouse for women with the style of a fashionable three-quarter length sleeve. Fabric: 65% Polyester 35% Cotton poplin 105 g/m². Classic shirt cut that combines exceptional durability with great attention to details. Easy care fabric: 70% cotton 30% polyester 130 g/m². This is a simple yet practical leather belt from Dickies. Dickies logo stamped to the feather end and a nickel finish steel buckle. Six hole belt with feather end. Ideal size: 38"-41" waist. Large. Ideal size: 34"-36" waist. Medium. Treated with Nanotech stain-resistant finish. Machine washable 40ºC and Dry Clean. The Andretta Corporate Ladies’ Trousers are a modern styled garment that offer both a great look and good wearing. The Miranda trousers has a low waist, false hip pockets for attractive detail and a waistband pocket. This garment is tailored from a specifically designed polyester/wool/Lycra fabric, manufactured to the environmental Oeko-Tex Standard 100 and treated with Nanotech stain-resistant finish. Suitable for all office, retail, travel and hotel workplaces. Short leg lengths - 27"
Regular leg lengths - 29"
Tall leg lengths - 31"
XTall leg lengths - 33"
Unfinished leg lengths - 36"
Here at North Sea Workwear we supply only the best workwear products form the best brands such as Amblers, Cotswold, Dickies, Orbit, Portwest and Sketchers.In this category you can find top notch Office clothing suitable for your everyday job. Comfort is very important for office workers. These Orbit PC245T trousers are an excellent example of comfort. Manufactured from a polycotton mixture, these trousers are both comfortable and durable. All of the products in this category are designed to be worn in formal circumstances, take the Cotswold Mickleton Gibson Shoe for example. This classy shoe has been crafted from high quality leather that has been textured with stylish outer designs. Our shirts are lightweight and manufactured from breathable materials in order to maximise the users comfort. The CSLS Orbit long sleeve shirt provides a superb fit along with uncompromising comfort. Range of office clothing also includes accessories such as belts which can be used to support the trousers in this category. Not what you?re looking for ? The why not have a look at our full range of products.